Handle them carefully: Invisalign can scratch and crack, so make sure you take care of it. Don’t pull them out too fast or drop them because that can damage your trays, making them ineffective. Don’t eat or drink with your trays in: The only thing you can consume while wearing Invisalign is water. The trays are not built for chewing, so they can be damaged easily, and food and drink can stain Invisalign effortlessly. 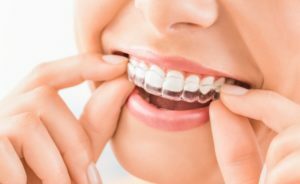 Don’t use toothpaste to clean your Invisalign: Toothpaste can damage the aligning trays and dull down the clarity, which makes them more noticeable. Don’t play with it: Invisalign can take a few days to get used to, but don’t play with it while it’s in your mouth. Keep your tongue away from your trays and don’t take them out too often. This could cause scratching of the trays or soreness. Don’t leave it in: Although you should wear them for at least 22 hours a day, don’t leave them in all day. Your teeth need to be cleaned multiple times a day along with your trays. Leaving your Invisalign in too long can prolong the treatment process. Knowing the do’s and don’ts of Invisalign will set you up for great smile success. Keep these tips in mind when you talk to your cosmetic dentist in Framingham about Invisalign or if you currently wear it! Dr. Marianna Gaitsgory has years of experience in general and cosmetic dentistry. She is committed to continuing education courses to remain up to date on all the latest practices. She even has 3D computer imaging technology to create the perfect Invisalign treatment for you today. She currently practices at Framingham Premier Dental and can be contacted by phone at (508) 875-0900.